Recipes,useful tips & good food-conversation! In my opinion the only people who know how to make desserts better than the french- are the italian. And boy do they know how to make them. 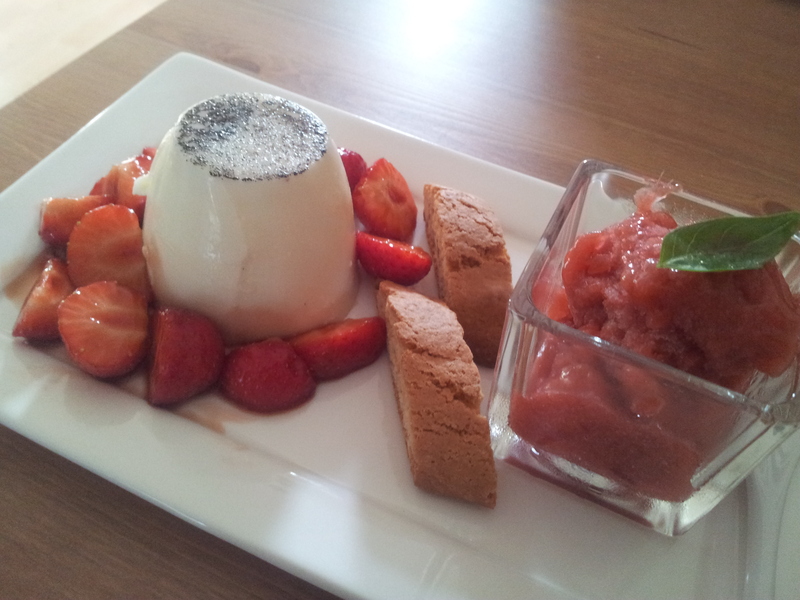 Here’s a recipe for my all-time-favourite, panna cotta, with what I call a ”vanilla hat”. I serve it with some crunchy catuccini cookies and a rhubarb sorbet.. so I suppose I could call it my ”italian dessert trio”. Anyways, however you call it – it’s delicious and worth trying out. It’s really not difficult, and most of the work can be done a day ahead! Start off by making the sorbet. It’s really easy. Just place your rhubarb,sugar,water and lemon juice in the pan and let it come to a boil. The rhubarb will loose a lot of moisture, so don’t be alarmed. Once it’s boiling,cook until the rhubarb completely falls apart. the smaller the chunks, the quicker it will happen. After 15 min or fast boil, the mixture should be pulpy and syrupy,sticky, and the rhubarb should be jammy in consistency & soft. When that happens, turn the heat off and let it cool slightly, before putting it into food processor and blitzing it until smooth. Put the mixture into a freezer-safe container and let it cool completely- moving it every hour or so. When it starts to freeze, blitz it every 2-3hours until you get a sorbet. When you’re ready to serve, cut your strawberries into chunks, add sugar and crema di balsamico. mix well. Turn your panna cottas out, by shaking them out onto your hand, you can use a small knife if they’re stuck to gently ease them out. 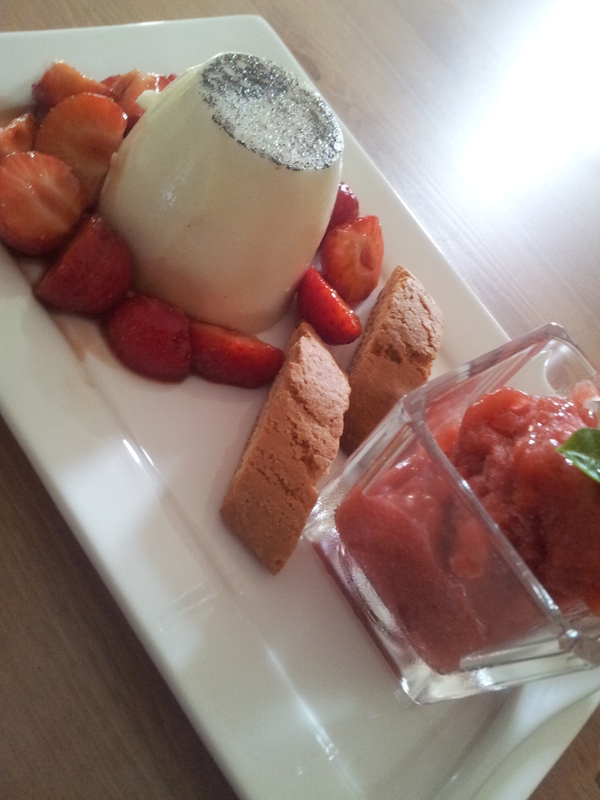 Place the pana cotta on the far left of the plate and arrange the strawberries around it. Put cantuccini cookies in the middle, and put the sorbet into a shot glass or a separate ,small glass or bowl. You can also use an ice cream scoop to shape it and place it directly onto the plate. decorate with a smally basil leaf. This combination of flavours came to me one day as a true revelation. Not sure why I haven’t thought of it before, so decided to give a try there & then. It’s an easy way to make an impressive meal, no pasta,potatoes,rice cookin required. Just bread. Which makes it perfect for long summer afternoons, when you don’t really feel like cooking much. First of all, marinade your pork. The longer the better, but 15-20 min will do the trick. Use pestle & mortar or food processor to make the marinade-paste, out of 2 garlic cloves, 2 tbsp of olive oil, 1 tsp of oregano,1 tsp of rosemary ,1 tsp of tarragon and 1 tsp of thyme. add salt & pepper and crush into a paste. apply it onto the pork and let it sit as long as you can. (min 15-20min). 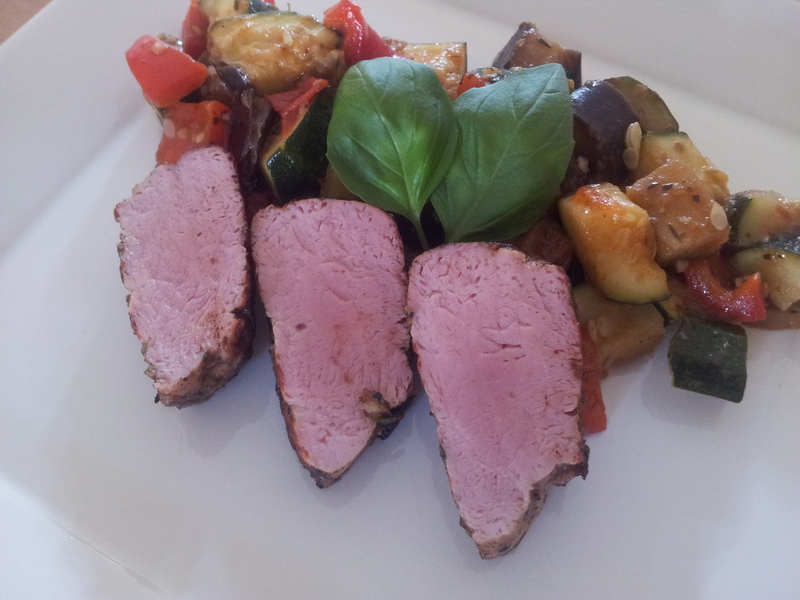 While the pork is marinating, you can prepare my quick ratatouille. Cut the vegetables into equal chunks. Heat up 2 remaining tbsp of olive oil and add your aubergine in.Let it cook for about 3-4min before you adding the 2 remaining cloves of chopped garlic. When the aubergine starts to brown up and is getting soft, add your courgette, bell pepper and tomato. add reamaining thyme,oregano and rosemary(finely chopped). Season with salt and pepper and add the wine. Let it evaporate and cook for about 5-10 min, or until the vegetables are cooked through. 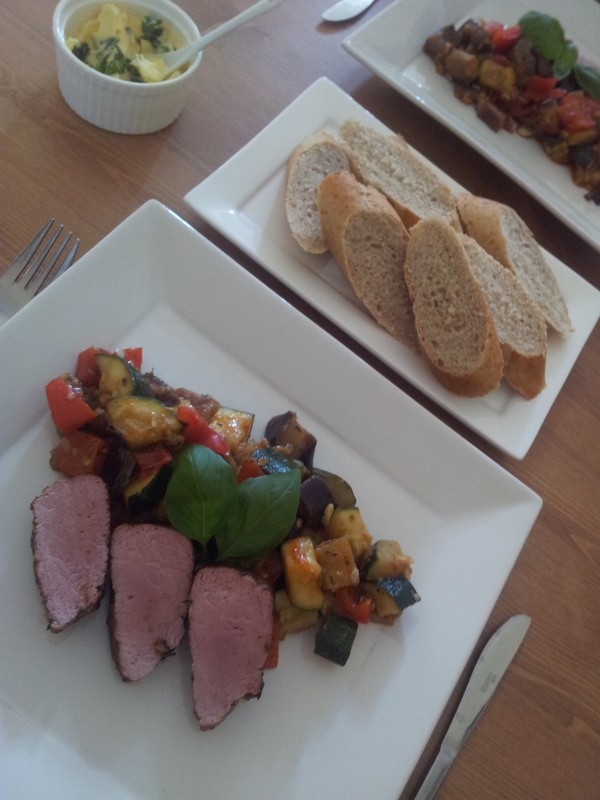 While the ratatouille is simmering, you can heat up some butter & oil in the pan, and fry your tenderloin. Fry in medium-high heat for the first few minutes, so the meat develops a nice brown crust, then turn the heat down and put the lid on, and let it cook through until it feels firm to the touch. Let it rest for 1-2minutes before slicing it. It should be nice and pink all the way through. Mix the soft butter with a pinch of salt and the basil leaves in a small bowl. There’s nothing better than a fresh, crispy salade in the middle of a hot summer day. 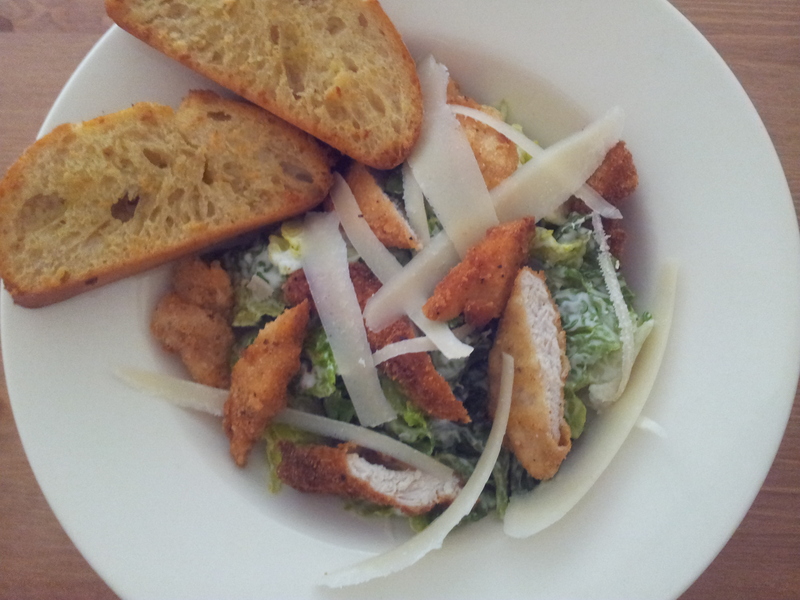 This salade is my version of a world famous Caesar’s salade. It might not be the most authentic thing in the world, but trust me- the flavours are there, and it’s worth a try for sure. large amount of oil, to shallow-fry the chicken in. 8 slices of ciabatta bread- toasted in the oven. For this recipe you will need three plates. Put your flour into one, your egg into the second and breadcrumbs into the third. Season your chicken strips with salt,pepper(or with any seasoning you like). toss them well, so they’re all covered equally. 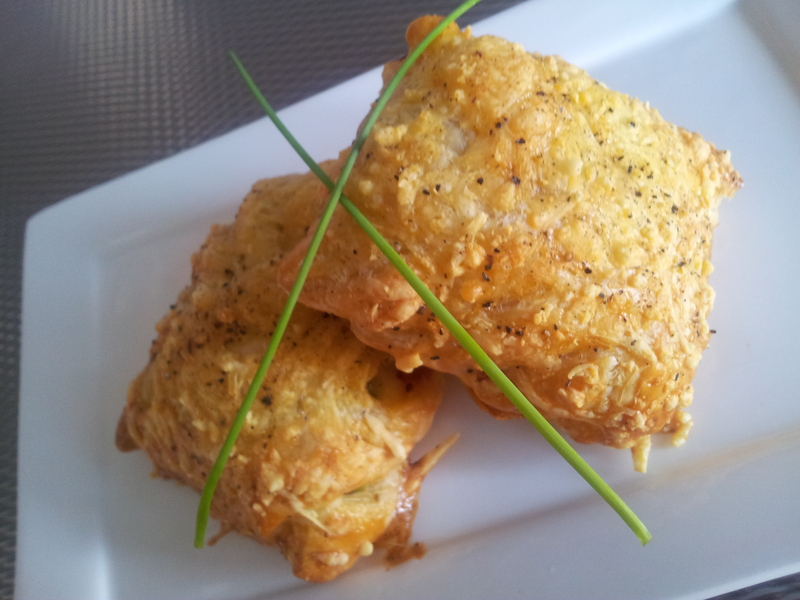 throw them into your flour-plate and toss until they’re all covered with a thin layer of flour. Then place them all in the egg, and toss until they’re all covered in a sticky layer of egg, only to throw them into the breadcrumbs, and toss again, until they’re all evenly covered with breadcrumbs. Throw your chicken strips one by one into the hot oil and shallow-fry until they’re golden from both sides. When they are,remove them from the pan onto a sheet of kitchen paper, to drain the excess oil. 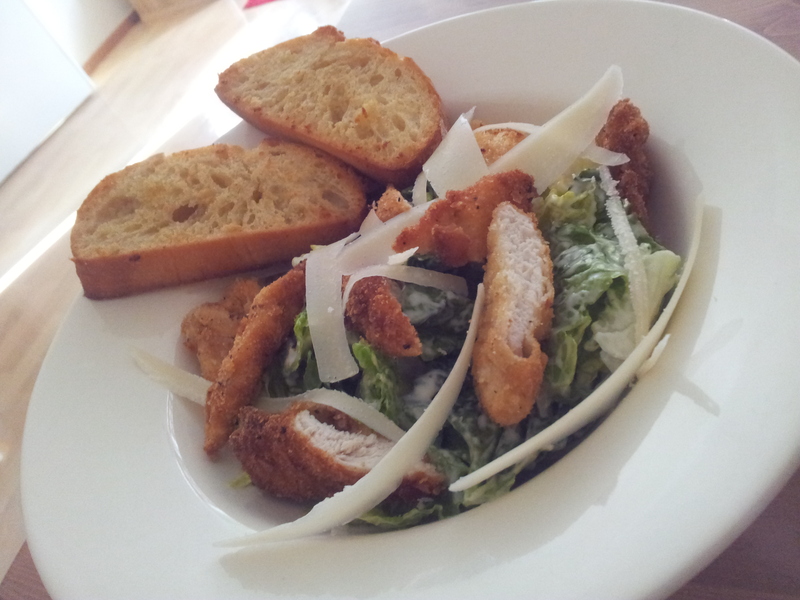 When all of your chicken is ready, let it cool slightly, while you make the dressing for the salade. In a large bowl mix mayo, yoghurt,lemon juice, a small pinch of salt and pepper. Mix well. add the crushed garlic and mix until well combined. Add your lettuce and toss patiently, until all of the leaves are dressed. 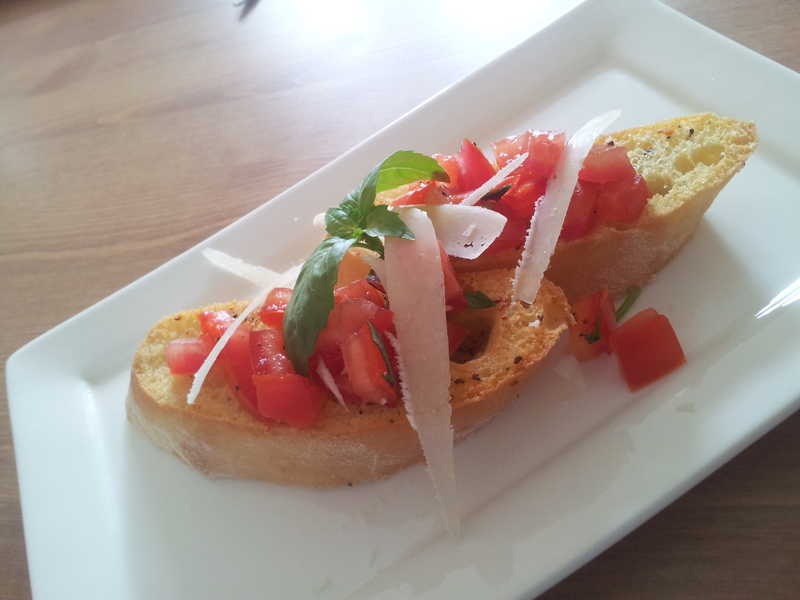 Bruschetta may sound like a fancy italian meal, it is however toasted bread with a tasty topping. You can eat it as it is- as a snack, a starter or a side dish.. it’s tasty and simple, ready in just a few minutes, so why not give it a try? about 10-15g of pecorino cheese (parmezan or grana padano are good too). Take the bread slices and place them on a baking sheet, crush the garlic clove into a small , microwave appropriate bowl, and place the butter in it. Microwave for about 30sec until the butter melts. brush the melted butter onto the slices of bread, making sure you cover them well (one side is enough). season with salt and pepper, and place into a pre-heated oven,150-160C for about 5-8min, or until the bread gets a little crispy & slightly golden. In the meantime you can prepare your topping. Cut your tomatoes open and remove the seeds and the crown. Cut the rest of the tomato flesh into small cubes, season with salt,pepper (you can add balsamic vinegar or olive oil,or a variety of herbs-use what you like). 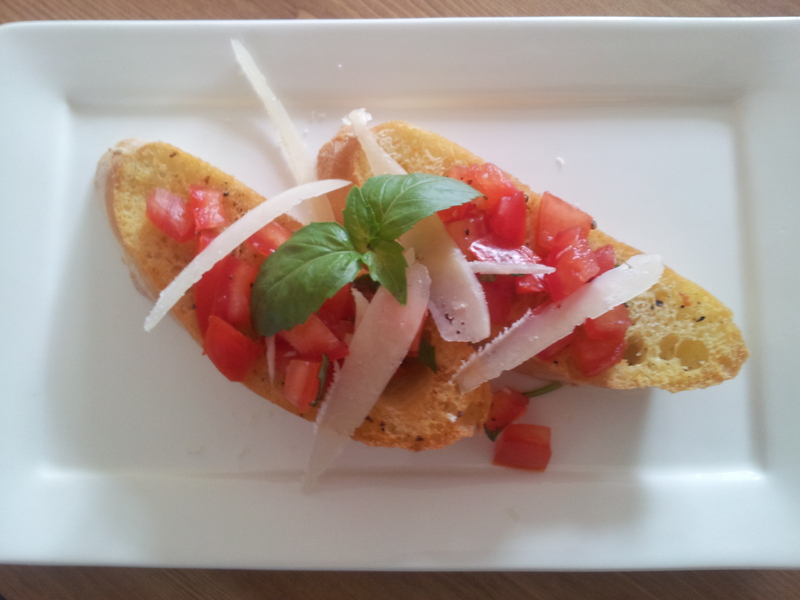 When the bread is ready,place it on a plate, spoon over some filling, garnish with basil and cheese. serve right away. 😉 enjoy! so, start by cooking your eggs.Cook them for about 8 minutes or until they’re hard boiled. The next step is to prepare your meatloaf mix. Tip your meat into a large bowl, add your breadcrumbs, your egg, your herbs,spices and seasonings. Everything goes into the meat at once,basically. If you wanted some extrea flavour,you could add some bacon,other herbs like rosemary or oregano,it’s completely up to you. This is just the basic recipe, whatever you do : season well with salt and pepper. 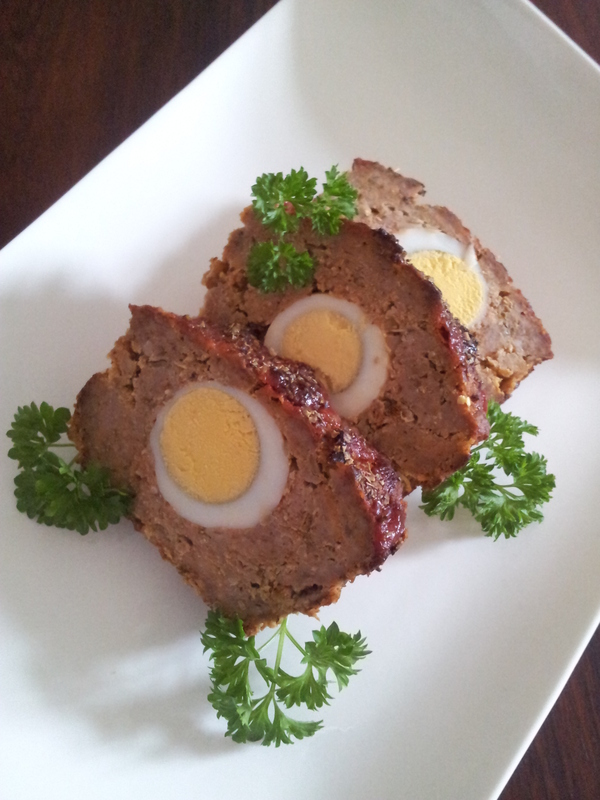 I mix the meat well, just until everything is incorporated, the trick with a good meatloaf is not to over mix. Tip half of the meat-mix into your tin, and push into the sides and corners well. Push up the sides to make a nice little nest for your eggs 😉 take your eggs and put them in the middle, touching eachother,so there are no gaps between them. Now tip the leftover meat on top, and press well, covering all the holes,gaps and nooks. You want to make it compact around the eggs. At this stage smear the top with ketchup if you want to. Makes for a nice crust. Bake in a preheated oven 175 for about 45min or until fully cooked and browned on the outside. Let it cool slightly in the tin, then tip it out,cut and serve. This recipe could be considered a snack, or lunch – served along a green salade with a light vinaigrette. The possibilities are endless, so take your pick. 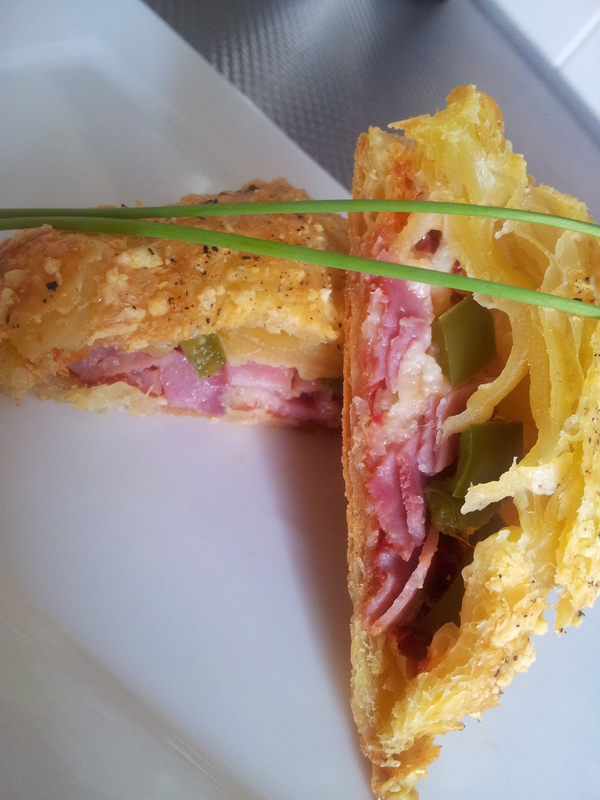 It came to me today as a revelation, I had leftover ham, grated cheese, tomato puree, some puff pastry and green bell pepper.. it felt wasteful to throw it out, so I put this little baby together, and I was surprised myself how tasty it is. You have to give it a try. take your puff pastry squares and smear an even amount of tomato puree in the middle, leaving about 2cm free from each side. divide the cheese into 4 even amounts, (leave some for extra sprinkling on top.) and sprinkle in the middle of your square. take your ham and pepper strips and layer them diagonally in your parcel. take your corners (the ones at the top and bottom of your ham/pepper strips) and fold them into the middle, so they’re touching eachother. it’s okay to press them together,you don’t need to be too delicate with them.. then take the edges and fold them over, pressing tightly so the pastry sticks together. put your parcels on a baking tray lined with baking paper, brush over a generous amount of eggwash, and sprinkle the remaining cheese and add a twist of fresh,black pepper. 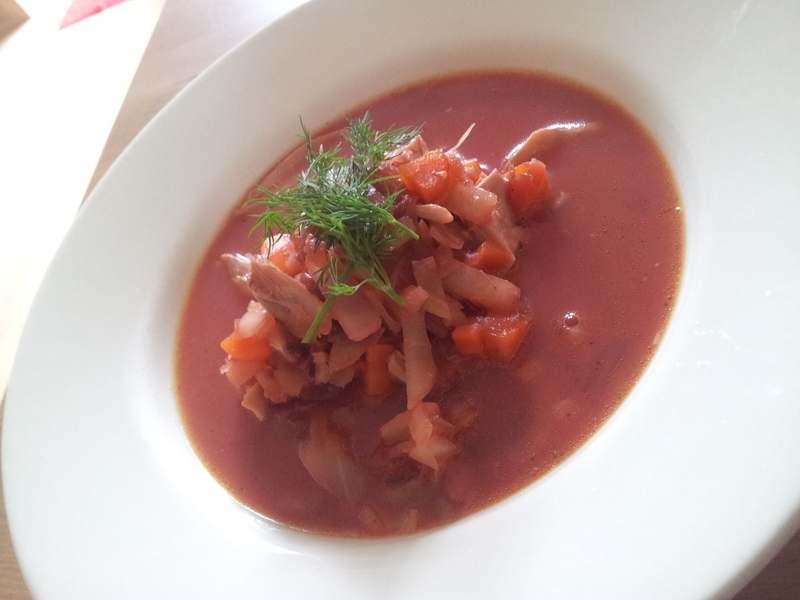 Ukrainian barszcz (or ukrainian beetroot soup, in polish ”barszcz ukrainski”) is one of my favourite soups. My mom would always make it in spring and summer, using all the delicious,new vegetables. It always seemed like a lot of work, but lately I gave it a go myself, and it really wasn’t that hard, and it’s certainly rewarding. If you’re cabbage and beetroot-fan, you’ll definately like this one! optionally- 4-5 handfulls of kale or curly kale. 3 large potatoes, peeled and diced. about 150ml of beetroot concentrate- or barszcz concentrate- available in polish delis. Put your chicken legs, leek and carrots into a large pot,cover with cold water-so the meat and vegetables are well covered, add your stock cubes, and bring to a boil.After that, cook for 45 min total,until the meat is fully cooked and falling off the bone.After about 18-20min remove the leek and carrot, and cut into chunks, setting them aside for later. After 40min the meat will be tender and falling off the bone,remove it from the stock and let it cool slightly,before peeling the meet from skin and bones. shred the meat into bite-size chunks. Add your shredded cabbage,curly kale and potatoes into the stock and let them cook for about 10-15min until completely tender. Then add your carrot and leek,the meat, shredded beetroot and the beans. Let everything heat through before adding the tomato puree, beetroor soup concentrate,salt,pepper, and about 1-2 tsp of sugar. You might need to add a teaspoon of vinegar, if you want your soup to be a bit more sweet and sour. Add your cream in the end, and turn the heat off. The soup will have a nice pink-red colour and will be filled with tasty vegetables. Serve with some fresh dill on top- you can choose to add a bunch of chopped dill to the soup, for extra flavour 😉 enjoy!